Our PROFILE®-V drug testing cassette devices — used with our MEDTOXScan® readers — provide performance, efficiency and value. Capable of testing for up to 13 drugs of abuse, this reader automatically provides fast and reliable screening results within 10 minutes right at your facility. 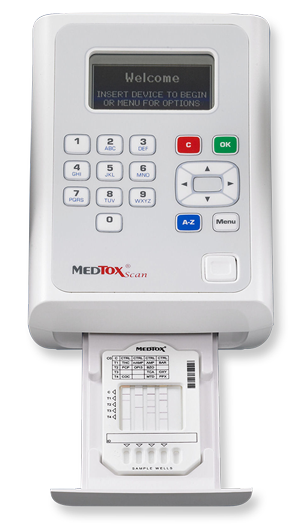 The MEDTOXScan reader includes a barcode scanner for accurate entry of patient identification, specimen ID and lot number. It provides both a digital display and paper copy of results as well as operator identifications. This innovative reader also offers automated device detection and the ability to interface with hospital laboratory information systems. Package Insert Rev. 07/17 – U.S.